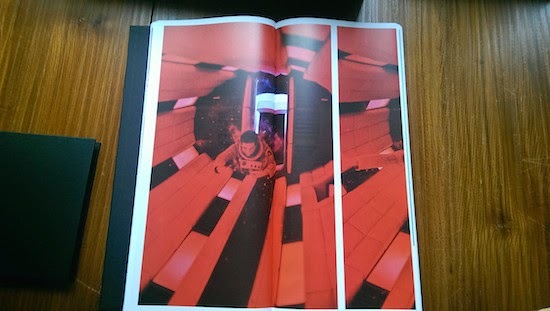 Piers Bizony, space historian and science writer, is the author of The Making of Stanley Kubrick’s '2OO1: A Space Odyssey', a book that you may have already heard of. 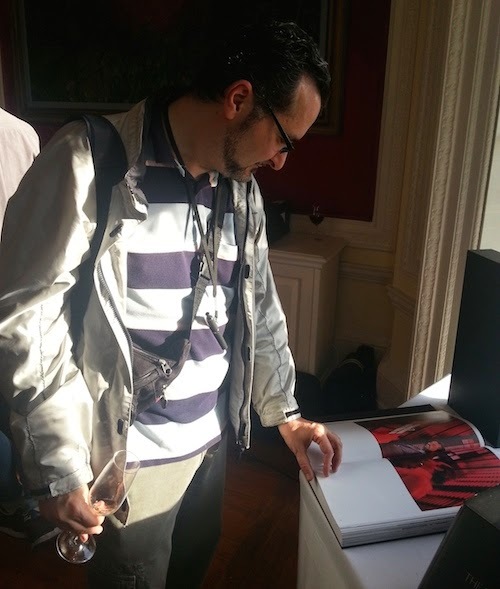 After the launch party at Kubrick's Childwickbury Manor he very graciously accepted to answer my questions about the book. Piers, in 1994 and 2000 you published two editions of '2001: Filming the Future', a groundbreaking book in its extended, in-depth look at the making of '2001'. When and how did the new 'Making of' originated? In other words, who (or what) brought you back into The Odyssey? I always knew that the first books were really very small, and that a great deal more material had to exist somewhere. Stanley Kubrick had given me permission to write and publish those first paperbacks, and had apologized to me that he was too busy (on A.I. and then Eyes Wide Shut) to offer much practical help. I was very dismayed when he died in 1999 at the not spectacularly great age of 70. 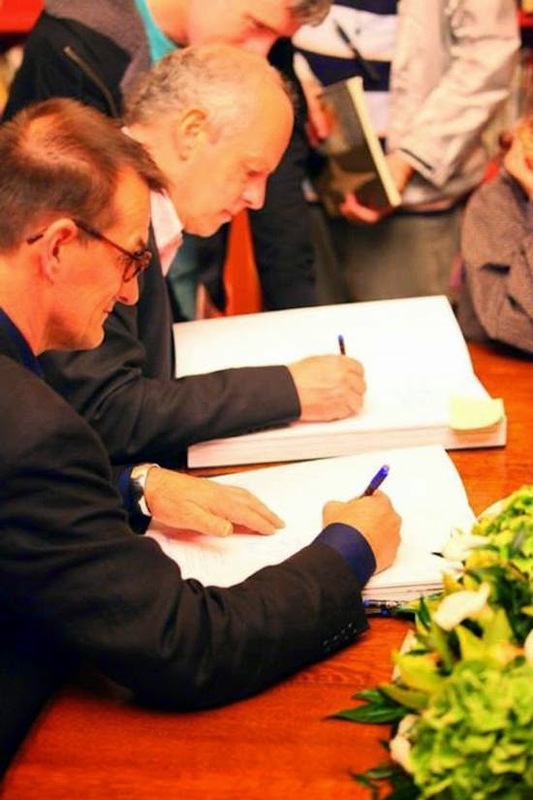 However, as another decade passed, I began to talk more with Christiane his wife, and Jan Harlan, his brother in law, about maybe reviving the 2001 book in a new and enlarged format. They were actually very enthusiastic, so that’s how this latest project began. You started your professional life as a photographer. Was this choice somehow influenced by your moviegoer experience, maybe by the very same '2001' - I’m thinking about its pristine look and impeccable photography? Absolutely! As a kid you come reeling out of that film wanting to be the person who makes things like that happen. You rush off and get a silly little camera and start snapping away. You start making drawings of fabulous interplanetary spaceships and so on. Then, as you get older, you are also inspired to read more seriously about science and philosophy, and learn about optical effects and cosmology . . . 2001 opens up the imagination in so many ways: artistically, technically and philosophically. 'Filming the Future' was your first book. Which role did it play in the decision of quitting photography and become a full-time writer? I had been working on the book part-time while getting on with other professional projects. You will find that most people’s first books are essentially created during spurts of available time in between other more urgent rent-paying work. I had a very good editor at Aurum Press - Sheila Murphy - and she went a long way towards convincing me that I could be a writer. However, I also did the layout and so on, using a very early Apple computer and a new piece of software called Quark Xpress . . . It was a fairly simple layout, but at least I had total creative control - another area where Sheila seemed willing to trust me. So this was a great introduction to the book world. We all need a supportive publisher from time to time, helping us to get on the road. You worked with major publishers before, but as far as I know it's the first time you work with Taschen. What was it like? Can you tell us about the 'Taschen difference'? 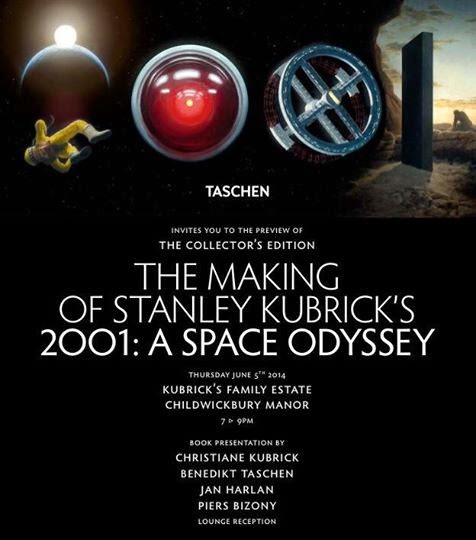 Jan and Christiane were keen on Taschen because of its earlier success with The Stanley Kubrick Archives. 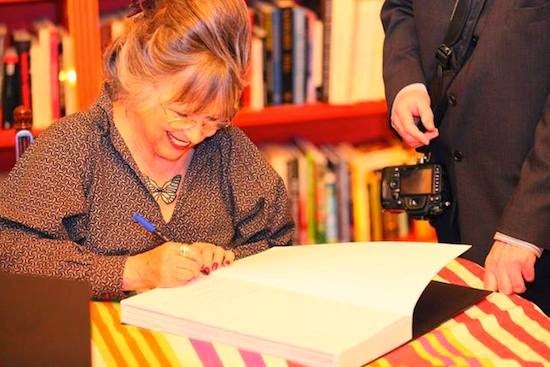 However, Jan was keen to stress that the family had been quite picky about what was published in that book. They had wanted to keep lots of material in reserve for other projects. So there was still masses of unpublished material available in Stanley’s personal archives that had not been published. My initial worry was that Taschen is a huge international brand, and I might just get “lost in the system” working with them. In fact, my editor there, Florian Kobler, was a very collaborative person and always very easy to reach by email or phone. He and I were the nexus of a large team, some based at Taschen in Cologne, others at M/M design company in Paris, and others (scan companies, archivists, photo digital retouchers, special illustrators) brought in on a case-by-case basis to solve particular problems. This was a massively complex project in technical terms. This is one of the reasons why the book might seem expensive at first, unless you appreciate all the circumstances of its production. 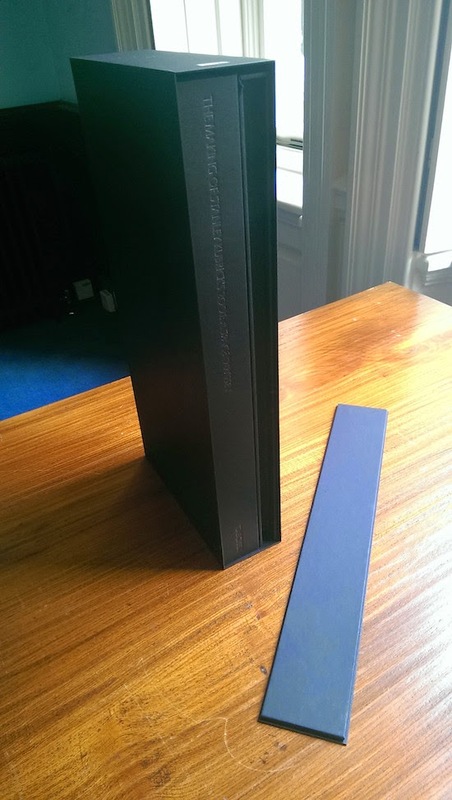 There were many heavy costs involved in the image preparation, quite apart from Taschen's desire to make the book itself - and its packaging and binding and presentation - truly special. Plus we had specially commissioned artwork from Oliver Rennert and Wayne Haag, and specially prepared prints from Brian Sanders (who, by the way, has recently been making publicity artwork for the fabulous Mad men Tv series). Although we can be hugely grateful that so much of Stanley’s archive has survived, even so, these materials for 2001 are essentially half a century old. A massive effort of colour correction, scratch and dust removal and digital scanning was needed. I have lost count of the dusty, scratchy, blurry images of 2001 that I have seen on the web. Most of these are second or third-generation copies of old images. In our case, we were able to go direct to original photos, transparencies and negatives held for safekeeping by University of the Arts, London (UAL) on the Kubrick family’s behalf. I should say, that relationship too involved a certain amount of bureaucracy and negotiation, but UAL was fantastically supportive throughout. It’s just that when you are dealing with any university system, things have to be done a certain way. The final product is composed by four distinct volumes. Were you in charge of all four of them? I would say it is a matter of degree. I was intensely involved in the main “Making Of” volume, swapping pdf notes with M/M designers, and with Taschen’s production department, pretty much every day over the last four or five months leading to print-ready files. I had a direct involvement in almost every page of layout, even though M/M and Taschen had last say on overall design style and layouts, of course. That was a very close and very constructive and cordial working relationship. Sometimes M/M and I would have lively discussions, but everything was always resolved quickly and to the benefit of the project. We all trusted each other's judgements in the end. It was my idea to include the production notes. Some pages are very brief, but others get very interesting and detailed, especially when talking about the huge space station set and of course, the complicated centrifuge. I also wanted to include the original Journey Beyond the Stars treatment that was submitted to MGM as a sales pitch for the film, because this is different in so many ways from any materials published before, and of course, it’s very different from how the film turned out. At first, for instance, there isn’t even a machine called Hal. 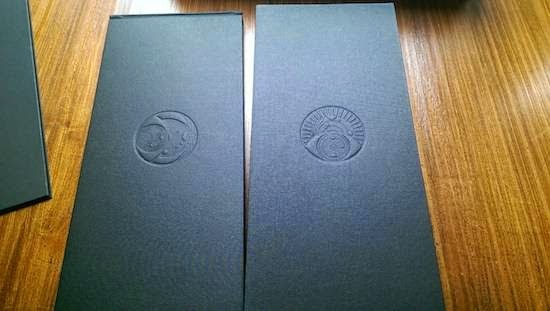 The film frames for the fourth volume were provided by Warner Bros., and probably this is the element of the project in which I had almost no direct involvement. Other than that - well, I try to be closely involved with any project that has my name on it. Checking if everything is all right, being careful not to get too close with that glass. What where the most challenging parts of such an enormous project? I made a lot of interviews in the year 2000 for a film about how 2001 was made. It was transmitted on the UK TV Channel 4, and also has ended up on the Warner Bros. Blu-ray disc of 2001. When you make a documentary, each interviewee speaks for maybe five minutes on film, but of course you originally obtain maybe an hour or two hours' worth on camera, which you edit down later. The transcripts to so many fantastic interviews were enough to justify a book rather than just a single TV documentary. That was the easy part of this latest book project. 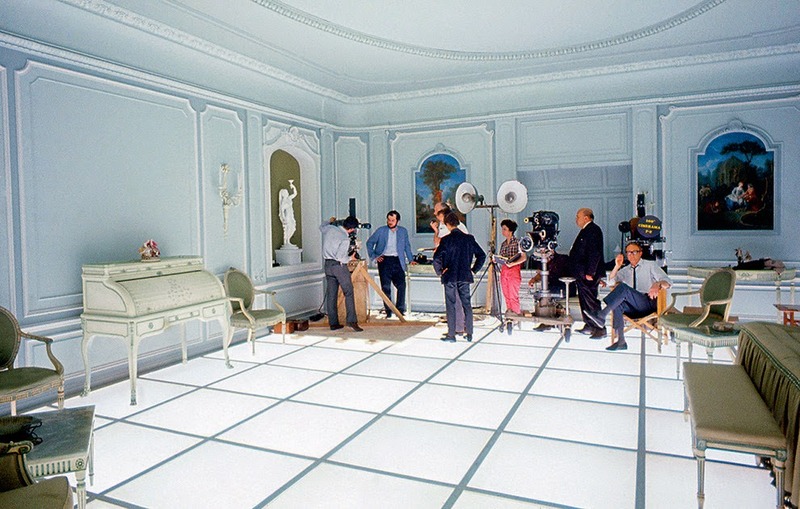 The hard part, most surely, was the negotiations that I had to undertake with four different entities: The Kubrick family, Taschen, UAL and of course, Warner Bros., who own the basic rights to the film, and are also the actual physical owners of the film itself. On top of this I also dealt with other private archives, seeking permits to use materials. There was a stack of contract documents on my desk, and I had to make sure that none of them clashed with each other - for instance, Taschen wanted maybe a 15 year license period to sell the book, while Warner Bros. had a standard five-year term, and so on. You pick your way through these things (which can really drop you in a mess if you get them wrong) and persuade everyone to reach a sensible compromise. There were days when I thought the whole project was so complicated I just wanted to give up! On the other hand, nursing it “through the system” did give me a sense of achievement. And I have to stress, all parties were incredibly open to making deals that would allow the book to happen. Everyone wanted to see it made. It’s no one’s fault that the movie world and the book world speak different languages. It was just a question of knowing this in advance, and anticipating and avoiding any misunderstandings. The end result was a fantastically smooth and amicable relationship between all parties. Warner Bros. was very supportive, and I even had an email hotline to their top lawyers. Tell us more about the images that appear in the making-of book. It's the first time that I see many of them, and even those who surfaced on the net before never looked so beautiful. Did they underwent a restoration process? Yes - hundreds of hours of cleaning up. Photoshop and similar tools are fabulous for this kind of work, but we had to take a conservator’s approach. A complete set of unretouched scans is held at the UAL. They are a backup so that future digital restorers can perhaps make their own versions of cleaned up and colour corrected images. On these backups you can still see all the tiny scratches, the stuck-down hairs, the thumbprints and so on. It’s just a fact of life that old film materials get pretty scratchy even when they have been kept carefully for 50 years. And of course they had suffered a lot of handling back in the 1960s, because that’s when they were being used, either for technical reference or for publicity. Even so, most of the materials were in amazingly good condition. What about the film stills in the other volume? It must have been an hard time choosing which particular scene to include! Not too hard. Stick a pin in any part of the film and the frame will be great. What was the most interesting, or fun, new thing you discovered about '2001' while researching for the book? Every time I went to the UAL archives I would find something that made me jump up with excitement. 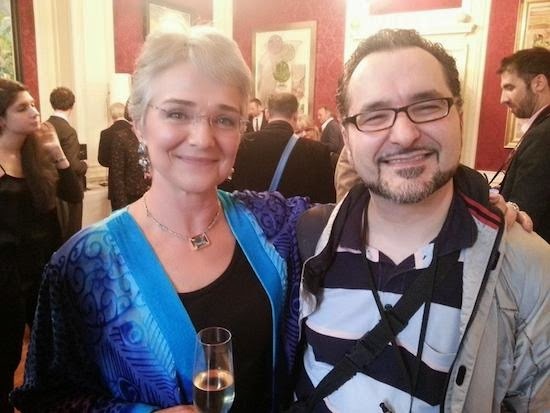 Richard Daniels and Sarah Mahurter - the very professional and well-organized people in charge there - got used to this. One example: there were some small brown envelopes with Polaroid prints stuck on the outside. Inside were smaller lint-free envelopes containing clean, crisp, large format negatives. In those days some Polaroid film types could deliver printable and enlargeable negatives as well as positives. Some of the bigger lighting reference shots of the spacecraft models came from these negatives, which could be printed up the size of posters if anyone wanted. So, that was exciting. Then the notes swapped between Arthur and Stanley were really great - like eavesdropping day by day on their discussions. Each visit to the archive was a new excitement, along with lots of painstaking note-taking, scan ordering and so forth. Such a work transcends its nature of a simple 'job assignment' - it's quite obviously a labour of love. 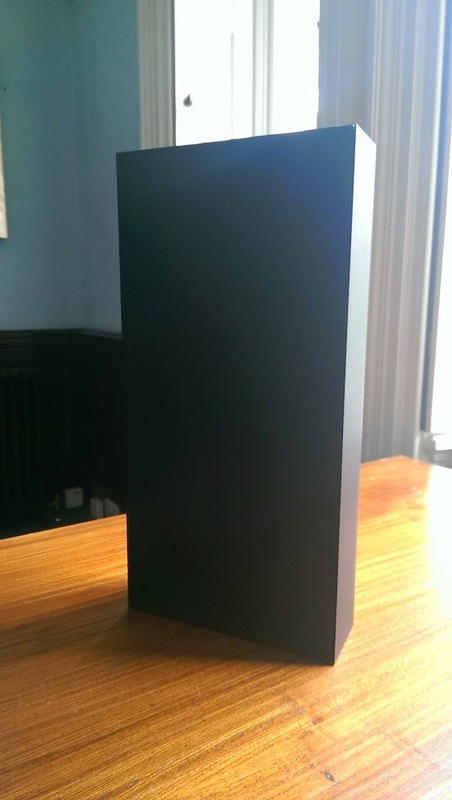 Now that you can see the final product, what is the single part/aspect of the book you're most proud of? Certainly this wasn’t a “job assignment”. This is a Taschen book without any doubt, but the essential idea, and the ambition for initiating the project, was mine, in partnership with Jan Harlan, with Christiane looking over our shoulders, so to speak, making sure that Stanley's work was being properly represented. I like to make things happen and to bring projects into the world, for sure. But you do need to persuade other people that it’s the right thing to do, especially when you are asking them to spend their money on expensive productions. 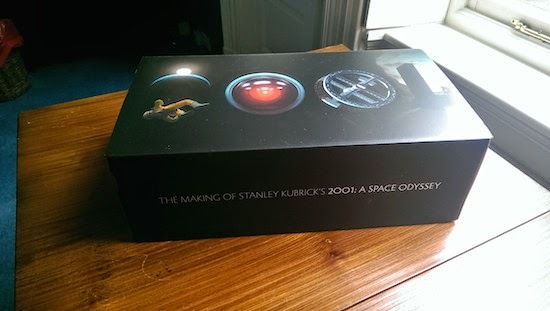 No one but Taschen, I think, could have done such a great job producing this unique book. There is a classic line from George Lucas (who, actually, paraphrased Leonardo Da Vinci): “Great movies are not finished, just abandoned". Is there something that, if you have had more time, would have ended up in the book? If you had to do it all over again, would you change anything? I was very thorough when investigating the archives but in retrospect I did not pay enough attention to black and white contact sheets that had no negatives attached. I just assumed we would not be able to blow any of them up if we didn’t have the actual film strips. One or two contact sheets perhaps I could have just reproduced in their entirety, just at their normal small scale. Well, it wasn't just Kubrick but a whole production team, so they got through a lot of research back then! But as an individual, researching the film all these years later, certainly I have tried my best not to make too many historical errors, although of course, sometimes you hear many different versions of certain stories from veterans of the production. Every time I see the film, I see new things. I never tire of it. I know I am not alone. Thousands of creative people around the world consider 2001 as a touchstone for their imaginations. Tom Hanks never tires of it, nor does Jim Cameron . . .
Why, in your opinion, is this movie still significant in 2014 - in a world that seem to have forgotten the achievements of the space age and in a movie landscape apparently only focused on teenage-oriented superhero movies? Let’s face it, 2001 is never going to be the huge mass-market phenomenon today that it was back in the 1960s. But intelligent, thoughtful people will always be found who will respond to the film. Even if people don’t like every aspect of it, 2001 is a part of history now. Everyone’s heard of it, at least. Everyone knows that it is the “daddy” of modern science fiction cinema. I think this Taschen project really is the last word from me - I can’t imagine that there is any more great material to be discovered. 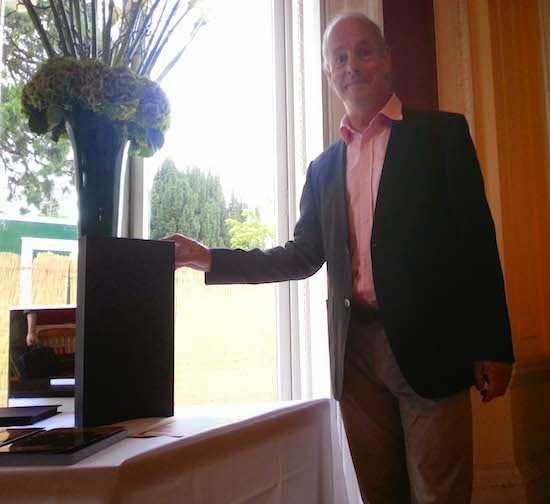 Sir Christopher Frayling is making a book about Harry Lange’s contributions to 2001. I certainly used some Lange sketches, but because our Taschen book is so biased towards big colour images, I did not want to use too many of Harry’s pencil sketches. I will be very glad to see Chris’s book later this year. Taschen sees his book as complementary, not competitive. When the Lange book comes out, I really think that fans of 2001 will have seen pretty much all there is to see - unless they want to dive into shooting reports, film stock tests, cast list phone numbers, fabric swatch samples . . . at which point, we get from the sensibly celebratory to the insanely obsessive. One of the tasks of a professional book writer and creator is to weed out the too-specific details and concentrate instead on good, visually and narratively exciting examples of such materials that give a general impression of what it took to make 2001, but without boring readers with too much information. Let's see how the book performs, and what fans think of it. I have to await their judgement. I have really, really tried my best to make a great book. That's honestly all I can say. In the meantime I look forward to working on something else for a while! 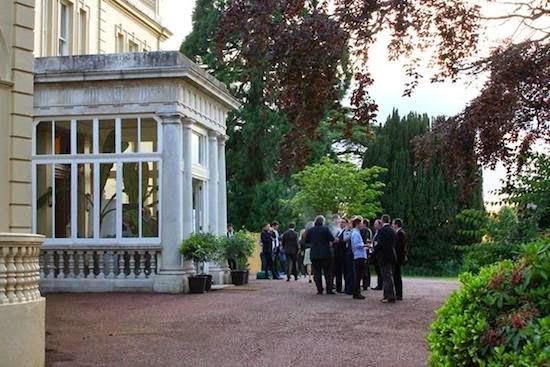 I covered the launch party at Kubrick's Childwickbury Manor here - on the top of that article you'll find many links with official photos and videos. If you want to know more about Piers, here's a couple of old interviews, his lecture at NASA's Goddard Space Flight Center, and another lecture on Yuri Gagarin. You'll find most of his books on Amazon (I've read and found particularly interesting the biography of James Webb, NASA's administrator in the Apollo years). 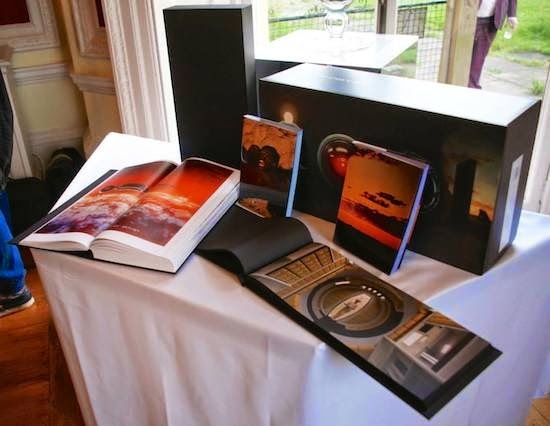 On June 5th, TASCHEN held the international launch for "The Making of Stanley Kubrick’s “2OO1: A Space Odyssey” at Childwickbury House in the Hertfordshire countryside. The house was not only Stanley’s home until he died but also his studio where many of his films were post-produced, and is still home to Christiane Kubrick who joked, during the presentation: "Stanley would be overwhelmed by the guests, the book .... and at how well I tidied up the house." More official pictures about the event: Taschen's Facebook Page, Taschen on Twitter, Taschen UK on Twitter, M&M Paris on instagram, M&M on Twitter, BFI on Twitter. More yet: Den Of Geek and Film Divider cover the launch party. 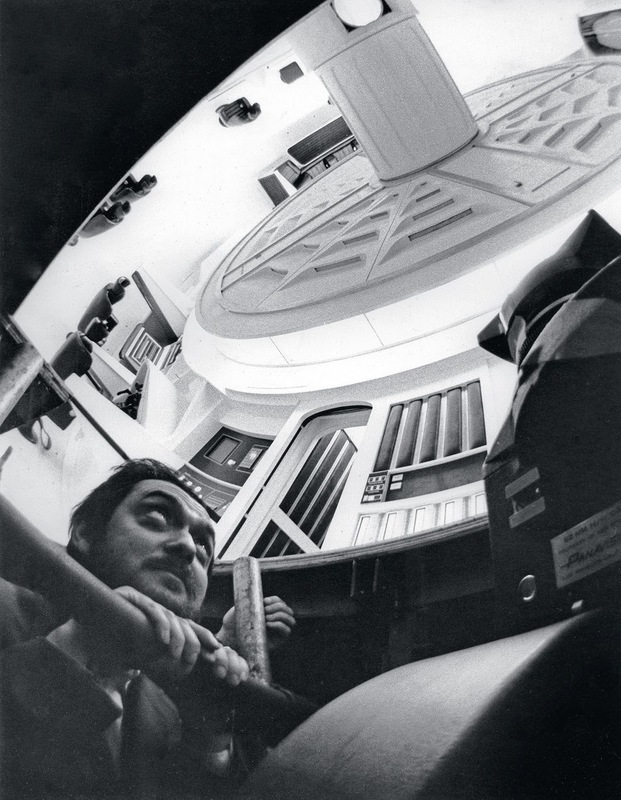 Kubrick peeks out from a hatch in the Discovery Set. 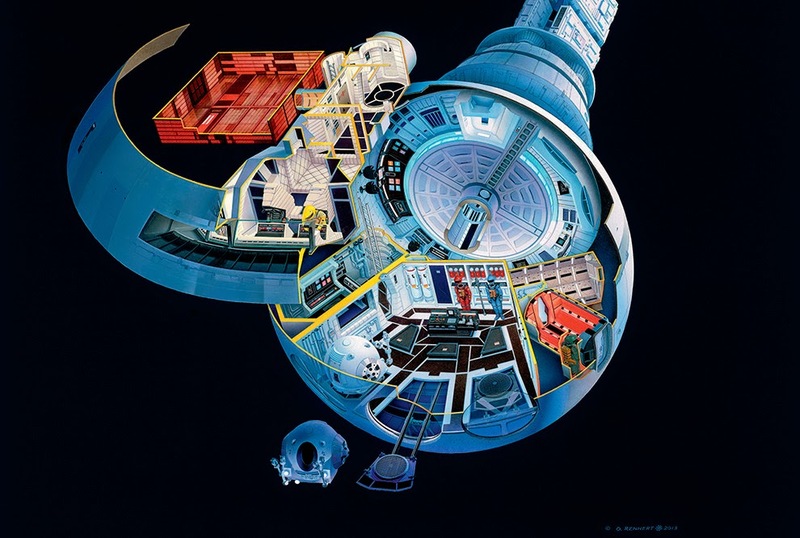 Artist Oliver Rennert was commissioned several artworks for the book; here's one demonstrating how the interior sets for the Discovery would fit in to the habitation sphere if the ship were constructed at full scale. 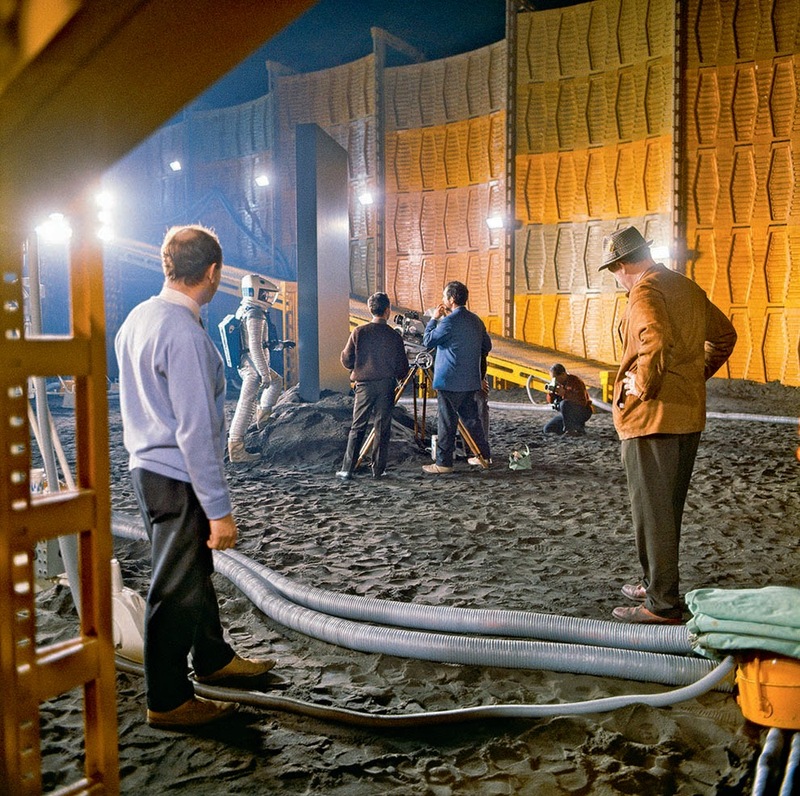 Stanley Kubrick directs William Sylvester in the monolith excavation scene. On the right, director of photography Geoffrey Unsworth. 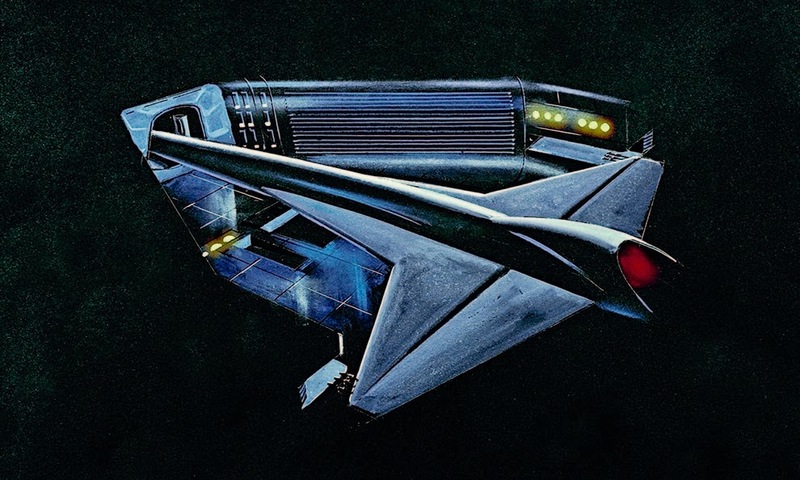 In 1965, Roy Carnon became one of the members of the team responsible for producing concept drawings, sketches and paintings for 2001: A Space Odyssey. His official designation was 'scientific design specialist and visual concept artist'. For this he was responsible for visualising space craft, film sets and the iconic 'wheel' space station, that in his rendering is almost indistinguishable from the final product. Here's my article about him. The monolith excavation set in a nice panoramic view from above. 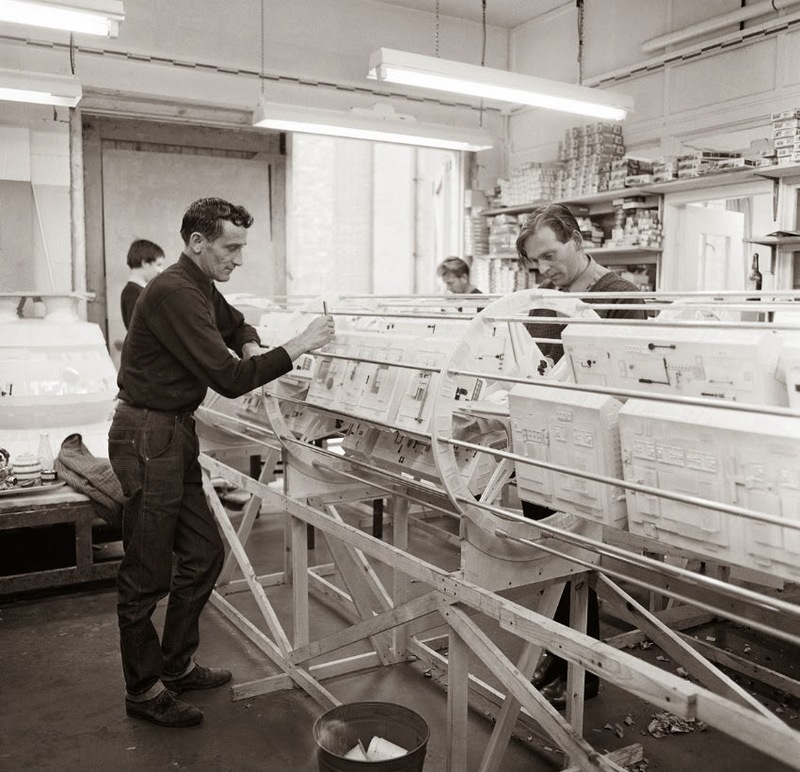 The Aries shuttle set under construction. 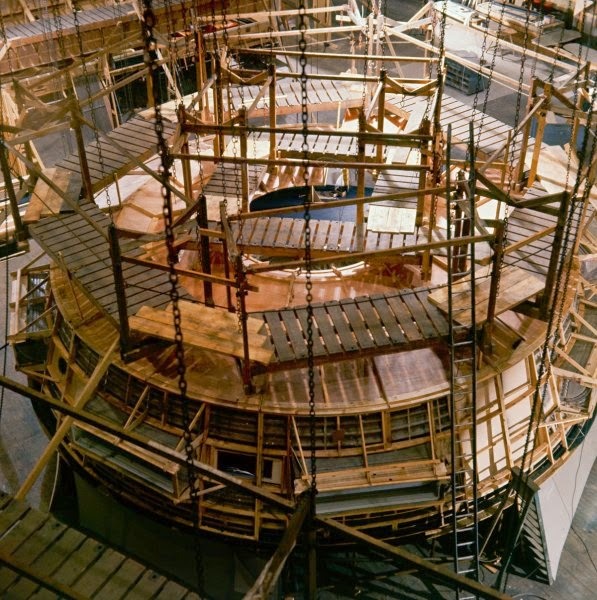 The large Discovery model under construction. Those rings, and the 'wireframe', were part of the original design, and were later discarded by Kubrick. 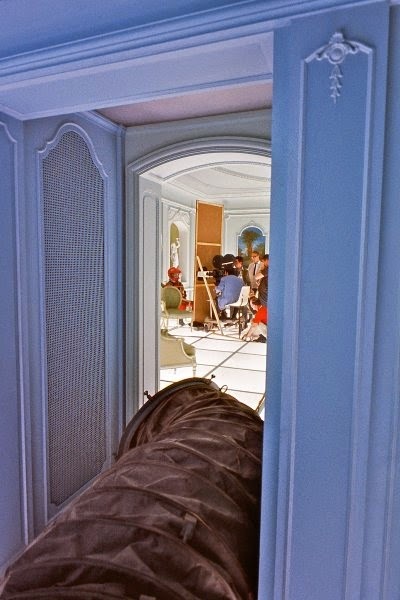 A beautiful view of Kubrick and the crew shooting the Hotel Room sequence. Keir Dullea is sitting on a chair, in a scene cut from the final edit (he was supposed to rest for a while after his incredible experience - Also, look at the cooling unit! The room was very hot because of the lighting system and also because the scenes were shot in June-July 1966).